GG didn’t take pie down to the Fawnskin Post Office this week. 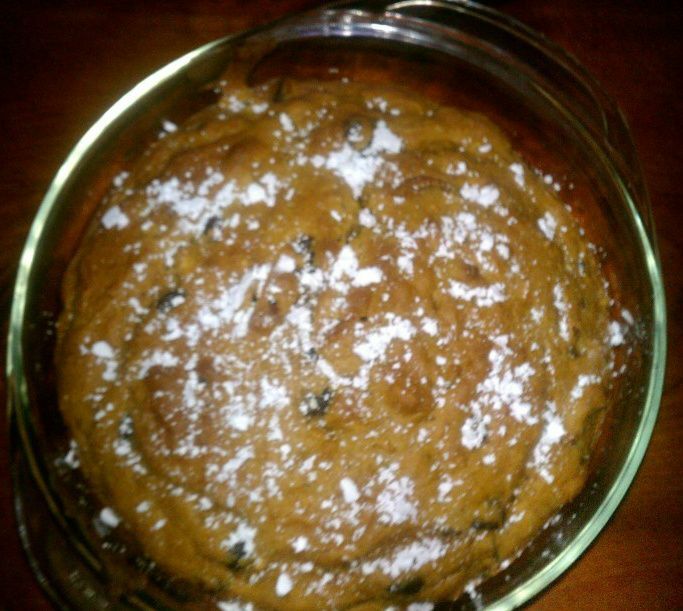 Instead I made a yummy Pumpkin Chocolate Pecan Cake! My secret strategy is to cook or bake yummy things, have a serving, helping, or piece of the concoction and then share it with neighbors or visitors. Works well and keeps the temptation out of the house. Since I am going to be taking some time off next week to work on 2012 editorial calendars and such, I thought I would take some time to share this recipe with you. Just be sure to oil and dust the pan with flour to prevent sticking since this is moist and can be very crumbly. Combine mix, pumpkin, water, eggs in a large mixing bowl. Begin to blend and while mixing, add pumpkin pie spice and baking soda. While things are mixing, combine chocolate chips and pecans and toss so they are equally distributed. Add to mixture until they are well dispersed. Bake for 45-50 minutes and check with a tooth pick to see if it is done. The top should be lightly browned and spring back if you press on the top lightly. Set on a rack to cool and then after 20-30 minutes, loosen the sides by inserting a long knife between the cake and sides of the pan and slide completely around so it releases. Invert or slide the cake onto a platter and dust with powdered sugar. This recipe was shared with me by a neighbor and, as usual, I played with it. Then, I discovered it is an adaption from the Cake Mix Doctor(R). You can find some of Anne’s yummy holiday recipes or buy the chocolate book. If you have dietary restrictions try the gluten free book. Enjoy and I will be back with you in 2012! For those of you sticking around town for the holiday, Moose Lodge 2085 & WOTM 359 are holding their annual Christmas dinner on Saturday, December 24th. No time was shared but usually things happen between 3:00pm-5:00pm. This dinner is provided at no charge to Fawnskin residents and Moose Lodge members. This entry was posted on Friday, December 23rd, 2011 and is filed under Baking & Cooking. What temp. do you set your oven? Hmm, it seem to have disappeared! 350 F is the temperature. I updated the post so thanks for pointing it out.